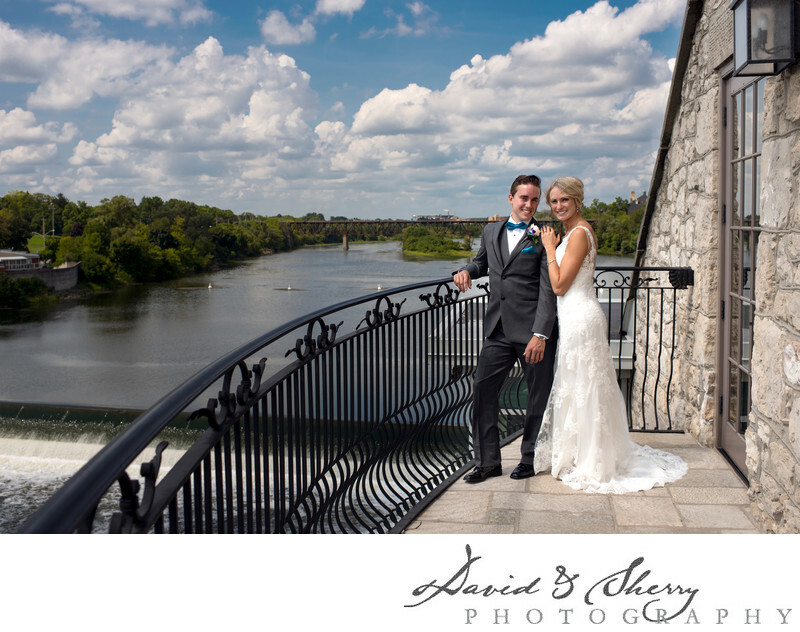 Hosting over 250 weddings a year can make you the expert in being the best wedding venue and Cambridge Mill takes their experience an applies it to each and every wedding. We have taken photos here for many weddings and though there may be a few receptions here each day it feels like we are the only ones present. Their on staff coordinators and the venue staff do a fantastic job of taking care of each and every one of their guests. 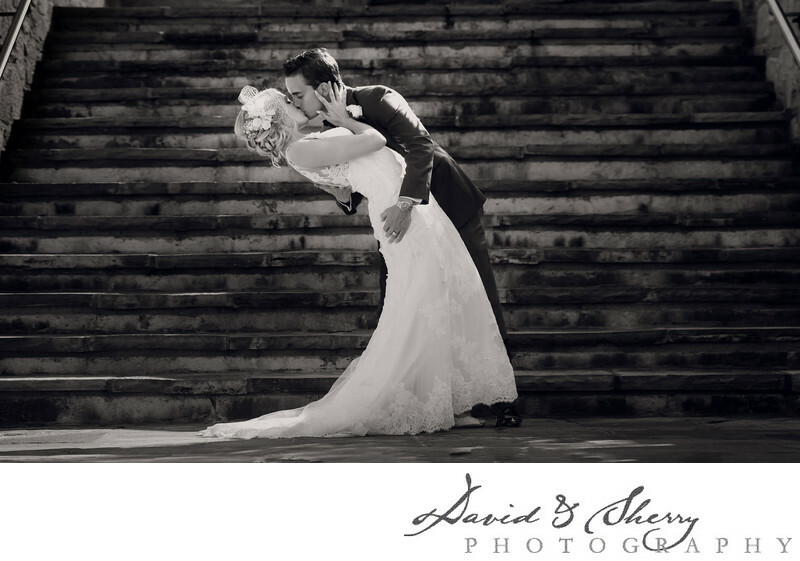 As there are so many pics being taken here each year, our job as Cambridge Mill Wedding Photographers is to make your wedding look unique and special at a venue which is full of beauty but is photographed each day. We take that challenge on and offer something special for each of our brides and grooms. Here are some of the things we look for on the day of. 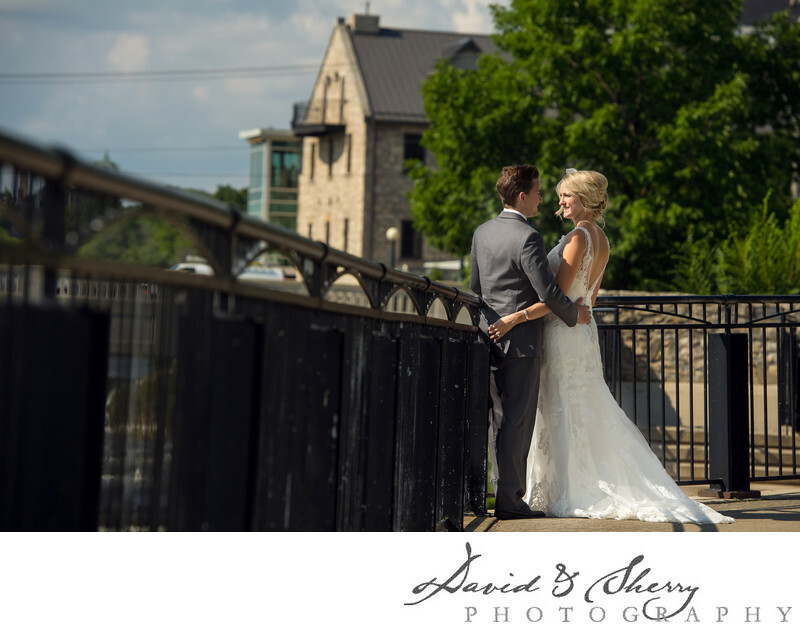 This iconic photo at Cambridge Mill is taken by most every photographer that works a wedding here. As you can see by this photo we have taken great care to place our newly married couple in perfect lighting, making sure that the afternoon sun strikes their faces with Rembrandt style lighting which is 30 degrees from the side, then we have finished the image with a bit of burning to the water and sky, allowing the couple to stand out in the image. We have taken the balcony photo from the road, from Mill Race Park across the street with a 400mm lens, we have even taken it across the river with a full view of the venue. At night time we have used the same space to create a flash lit interesting portrait of the bride and groom together kissing. We are always on the lookout to give a different look to the same thing and create the unexpected. 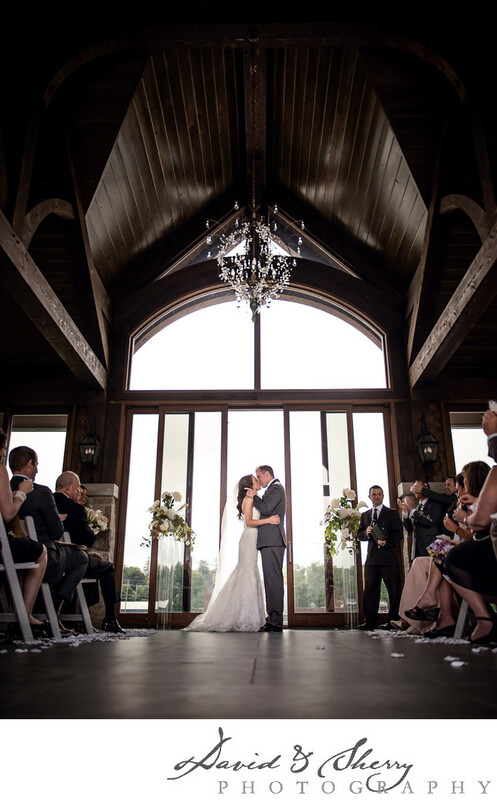 There are several rooms to choose from to hose your wedding reception. Hand-carved beams, double-sided fireplace, 12-foot high ceilings, casement windows, exposed stonework and soft lighting bring our heritage detail to your celebration. Having a seating capacity of 200 this room can fit very large groups of your guests. Containing a fireplace and cozy feel this is a fantastic place to bring your family and friends to get to know each other and enjoy the day of your wedding in style and comfort. It has a seating capacity of 100 people. The Pavilion is one of the things that makes Cambridge Mill unique to most every other venue we have photographed. The designers have taken the premier location on their riverside property and created this beautiful climate controlled space with stunning views of the river and capacity to seat 220 guests and made it into a ceremony specific building. They have placed it at the end of a long walk down a beautiful stone walkway so the bride and here dad can spend a wonderful amount of time together before she reaches the alter and her groom. We love taking pictures in this space, especially when we put a couple of flashes on the bride and groom to balance the interior darkness with the bright outside. As a result we are able to capture the bride and groom as the bright focal point with nature behind exposed properly. We have spoken in length in other posts about MIll Race Park, but suffice it to say that being wedding photographers at Cambridge Mill has it's perks when we have the park all to ourselves and can explore the three different sections of the park in order to create modern, classy, stylish, with a touch of vintage wedding photos all in one small space with an amphitheatre, pathways and landscaped areas. During the reception in each of the rooms the ambiance is beautiful but it is our duty as the people trusted to take pictures to make sure the bride and groom, mother and father and the bridesmaids and groomsmen all look their best. We will often set up lighting to compliment the reception feel and to pin light the couple on the dance floor. We will sometimes use on camera flash as well as off camera flash to accomplish night time rim lighting or spontaneous photos of the couple with their close friends. We will put these lights on a lighting stand or have an assistant hold them and walk around the dance floor with us. One of the unique things we offer to your wedding coverage is night photos or portraits. This is a time when we take the newlyweds outside or into the building where we have access to create some images using lighting we bring along with us. These can be colourful displays incorporating the decor or they can be landscape type images with the bride and groom lit up with a flash and Magmod grid and gels to make sure the light only spills onto the subjects. We have been practicing these styles of photography for years and these pictures offer the best review of our work.